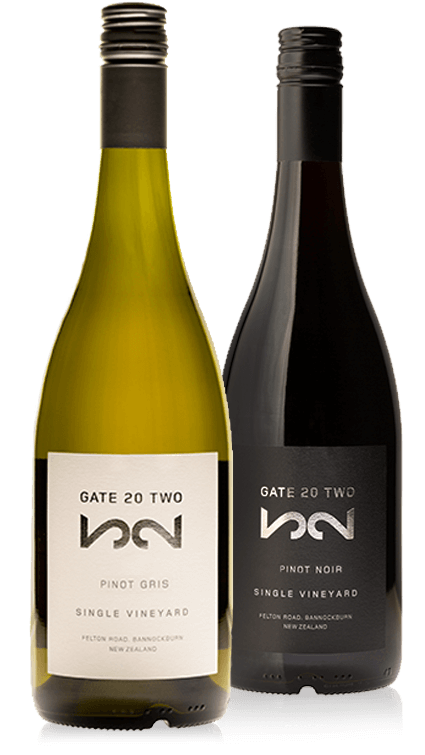 Gate 20 Two is a family owned 5 hectare vineyard, situated on rolling slopes at the base of the spectacular gold diggings in Felton Rd. Bannockburn in Central Otago, New Zealand. This is an area of extraordinary beauty, surrounded by rugged thyme covered hills and mountains, lakes and rivers. It is also an area rapidly gaining recognition as one of the few areas in the world able to produce pinot noir of stunning quality and complexity. Experience the stunning quality and complexity of our wines first hand. Elegant wine, rich and warm with raspberry, red fruits and plum giving an aromatic and perfumed nose. Depth of fruit, along with good structure and balance promise a wine that will just get better with age. Very aromatic and full of flavour, with excellent body and texture. The signature peach, nectarine and pear flavours of the site are fresh and delicious with a tropical finish.